What is a Flow Diagram? How To Create a Diagram? With every blank canvas there is the opportunity to create something great. When you take steps to plan your website’s user experience, it places you on the path for creating a rich website that is engaging and intuitive. We at Slickplan have designed a powerful diagram designer that fits well into any website planning process. 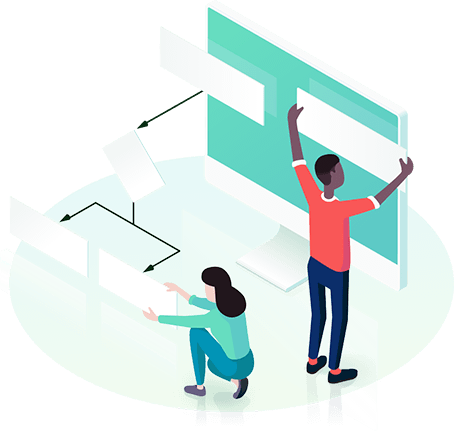 Specially designed for web planners and teams, our diagramming tool offers a symbology library, automated design functions, collaboration and sharing features, and more. Tightly integrated with our sitemap builder, our diagram tool is the digital canvas you have been looking for. Design a diagram for website user paths and interaction with Slickplan’s intuitive drag and drop interface, and create beautiful visualizations with ease. Craft potential user paths and interaction locations for your site including conditional branching, decision points, and page clusters. Slickplan engineers are hard at work to bring you the best website diagramming tool on the planet. Plan powerful user experiences on your website with our specialized and purposeful platform. Design diagrams using simple yet effective symbols representing website elements and desired interactions. Draw connectors between diagram objects and add labels. Easily share website diagrams connected to your sitemaps by emailing links to a simple and beautifully rendered html view. Export your diagrams alongside your sitemaps in a variety of formats. Learn what make a flow diagram different from all other diagram types and why it is so important in user experience planning. Get started by creating your own website flow diagram from a user first perspective. Learn our step-by-step methodology. Check out the full features offered with the Slickplan diagram maker. Find out what this powerful app can do for you and your users. Learn about the best way to plot and optimize user flow paths throughout a website. Get some helpful tips and a tutorial from the Slickplan team. Slickplan uses the JJ Garrett Symbol library. Take a detailed look at the meanings and usage for each diagram symbol, connector, and design element.